Whenever Patsington and I spy an amusing animal, one of us will always say, in a very serious voice, "ah, look, there's another of Ju Ju's friends." And then we give the animal a name, usually a very prosaic one. 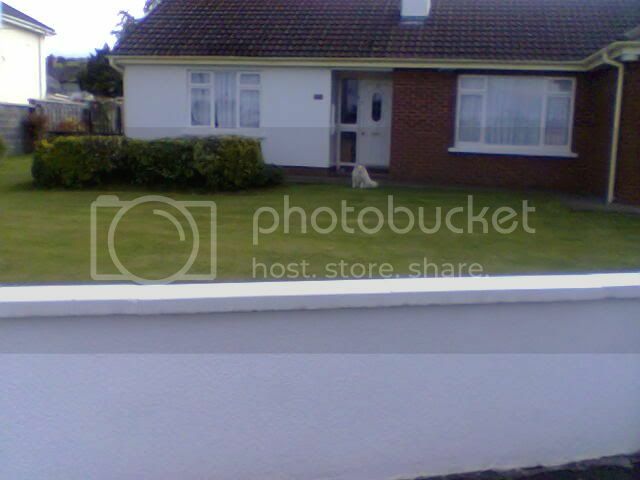 A few months ago, we took the alternative route home from the bus stop and spotted a hilarious-looking fluffy white dog sitting outside a house. "Oh my God, it's Ju Ju in dog form!" said Patsington. "What do you think his name is?" I said. "Gerald," said Patsington, without missing a beat. And so Gerald he became. I always look out for Gerald if I take that route home from the bus stop, because he's just so incredibly fluffy and funny-looking. But this afternoon I was on my way home after a delightful lunch with barsine, and I passed Gerald's house. 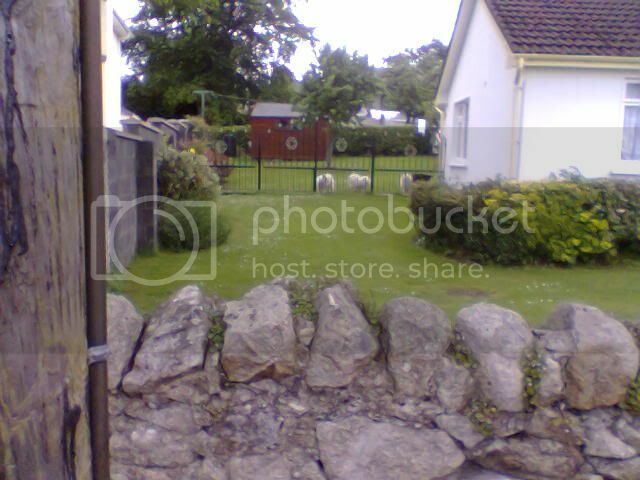 And imagine my amazement when I saw not one Gerald, but THREE! Obviously he sheds fluff bits like a dandelion, and they become other Geralds. Next week there may be twenty. Yes, exactly. Do not accept a Gerald "puppy" under any circumstances! What are the other JuJu's in dog form called? And I have a whole story forming in my head about JuJu creating dog forms of her as minions and her secret cloning lab. Gerald is Ju Ju's only canine chum so far, but his new siblings don't have names yet! Some of her other imaginary friends (who include an owl, a preposterously fluffy goat we saw on the news, a fish, a thing that looked like a pantomime cow that we saw in an ad in the vet's, and a dormouse) are called Lionel, Muffles, George, Fishington, Bu Bu and Hoots. I should add that they're the only ones I remember - everytime we see a funny-looking animal we decide it's one of Ju Ju's mates, so the list is endless! JuJu's Band of Fluffy Minions. Can I keep a miniature version of you and Patsington in my pocket? You're so adorable! He looks like a Japanese Spitz. Cute! I used to have a Samoyed dog, which looks like a bigger version of that. Yes, that's got to be his breed (and that of his fellow triplets)! Except he's fatter - in fact, he's practically spherical, although you can't see that in the photos above. I don't know why he looks like he's so far away, actually - my camera (well, my phone) and I were only about 15 feet away from him.